Berlinica Publishing LLC, 9781935902232, 208pp. A complete satirical selection from the "man with the acid pen and the perfect pitch for hypocrisy,” as Tucholsky-expert Peter Wortsman writes, this book contains Tucholsky’s news stories, features, satirical pieces, and poems about his hometown Berlin. 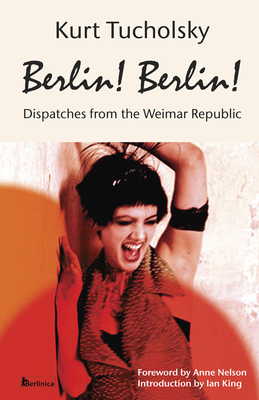 It depicts Weimar Berlin, its cabarets, its policies, its follies, its ticks, and its celebrities, such as Pola Negri, Gussy Holl, Bert Brecht, Max Reinhardt, and Heinrich Zille. Herr Wendriner, the chatty Berlin businessman, makes an appearance, as well as Lottchen, the flapper, modelled after one of Tucholsky’s real-life girlfriends. The book contains some of Tucholsky’s most famous pieces, more than one satirical biography of the author himself, and some of his most famed stories. Kurt Tucholsky was a brilliant satirist, poet, storyteller, lyricist, pacifist, and democrat; a fighter, ladies' man, reporter, and early warner against the Nazis who hated and loathed him and drove him out of Germany after his books were burned in 1933." The New York Times" hailed him as "one of the most brilliant writers of republican Germany. He was a poet as well as a critic and was so versatile that he used five or six pen names. As Peter Panter, he was an outstanding essayist who at one time wrote topical sketches in the "Vossische Zeitung," which ceased to appear under the Nazi regime; as Theobald Tiger, he wrote satirical poems that were frequently interpreted by popular actors in vaudeville and cabartes, and as Ignatz Wrobel, he contributed regularly to the "Weltbuhne," an independent weekly that was one of the first publications prohibited by the Hitler government." Tucholsky, who occupied the center stage in the tumultuous political and cultural world of 1920s Berlin, still emerges as an astonishingly contemporary figure. Ian King is a translator, the chair of the Kurt Tucholsky Society, a lecturer, and the co-editor of the third volume of "Tucholsky s Complete Works" and the conference volumes for the society. He lives in London. Anne Nelson is a professor, a media consultant, a member of the Council on Foreign Relations, and a playwright who specializes in media and international affairs from a human rights perspective. She is the author of "Red Orchestra" and "The Guys: A Play." She lives in New York City."